On his first day in office, in January 2015, Major League Baseball Commissioner Rob Manfred announced his interest in “inject[ing] additional offense into the game.” Over the previous several seasons, scoring in baseball had dropped to levels not seen since the mid-1970s, as an expanded strike zone, an increase in average pitch velocity, the rise of defensive shifts, and detailed data on batter tendencies had combined to keep runs scarce. Manfred mentioned banning the shift as a possible solution to the scoring decline, and he considered shrinking the strike zone and adding the designated hitter to the National League. But he decided to see whether the trend persisted before taking action. He was right: Just as it began to seem certain that only a deus ex Manfred could rescue the sport from soccer-esque scores, baseball’s offense came back from the brink. The only problem is that no one knows why, or whether it will last. To unravel the mystery, we examined the most likely suspects — warmer weather, better rookie bats and bouncier baseballs — completing our investigation by shipping a bushel of balls to a laboratory for testing. Manfred’s tune changed because of what he called “a really interesting uptick in offense late in the year … a statistically significant increase in scoring.” Below is a graph of runs scored per nine innings in each regular-season month from 2000 to 2015. 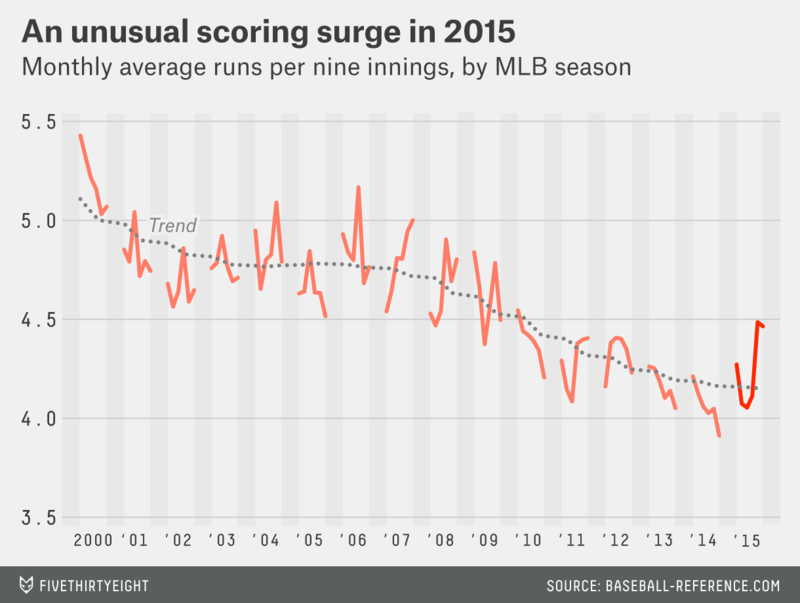 It shows a steep climb last August and September/October, and although it doesn’t display postseason scoring — which is typically lower than the regular-season rate — teams averaged 4.36 runs per game during the 2015 postseason, more than they had scored in any month from April through July of that year. We can’t credit last year’s increase in offense to a reversal in strike-zone size: The zone actually grew again in 2015, albeit very slightly. 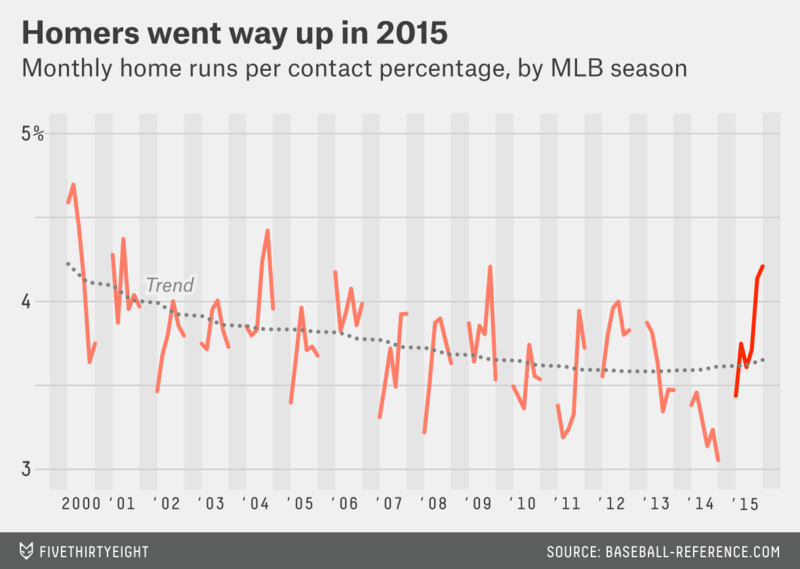 Similarly, strikeout and walk rates barely budged. But home runs rebounded by enough to produce most of the extra scoring. The graph below shows monthly home-run rates as a percentage of contact (HR/Contact), where “contact” is defined as at-bats minus strikeouts. Once again, playoff rates aren’t pictured, but in 72 games last postseason, HR/Contact leaped to 5.1 percent, which would literally be off the chart. The HR/Contact rate last August was higher than it had been in any month since August 2009, and the rate last September/October was higher than it had been in any month since August 2004. On the whole, the percentage increase in second-half HR/Contact, relative to first-half HR/Contact, was higher for the 2015 regular season than for any previous season since at least 1950. 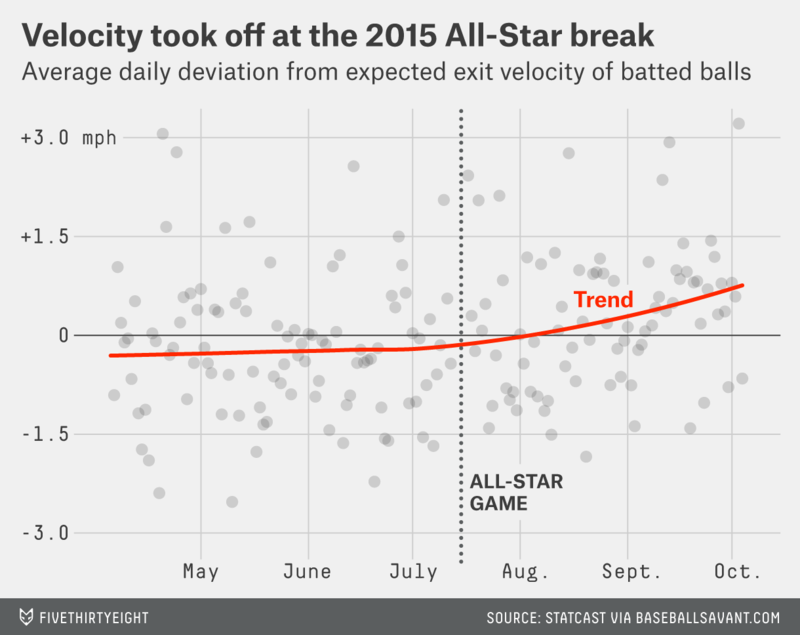 Perhaps not surprisingly, the speed of the ball off the bat, as measured by MLB Advanced Media’s tracking system Statcast, also increased late last season. 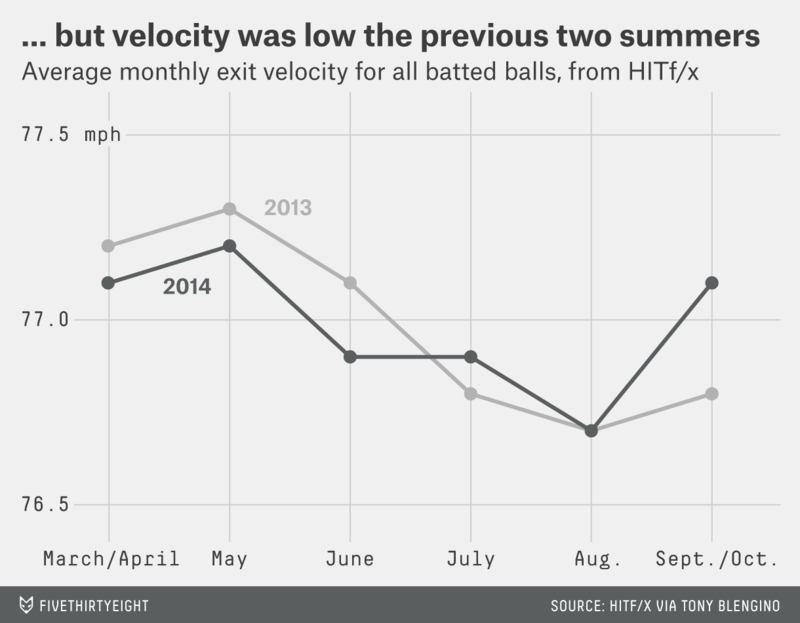 Average exit velocity in September/October was about a mile per hour higher than it had been at its low point in June. After the World Series, we surveyed members of almost every front office to find out how baseball executives accounted for the offensive renaissance in the second half of last season. Three theories predominated: unusually warm weather, which decreases air density and helps batted balls carry; an unprecedented influx of powerful rookie hitters; and a decline in pitching quality stemming from good pitchers being shut down as pennant races resolved themselves early. Although existing baseball data makes it difficult to analyze the effects of wind and humidity, temperature alone isn’t a satisfactory answer. In-game temperatures were higher during the last two months of the regular season than they were earlier in the season, but Hardball Times writer Jon Roegele found that those extra degrees explained only a small percentage of the rise in scoring. According to physics of baseball researcher Alan Nathan, a 1-degree climb in average temperature would increase home-run rate by only 0.6 percent, so dog-days heat likely had only a modest effect. The other theories are more persuasive. Last season was an outlier in terms of rookie production, featuring the most productive rookie position players of any year on record. Although many top prospects made productive debuts early in the year, rookie hitters upped their games even further in the second half, when studs such as Miguel Sano, Corey Seager, Francisco Lindor and Carlos Correa did damage immediately. Rookie hitters totaled 155 home runs in August, an all-time record for rookie homers in a single month. And, anecdotally, a number of teams that were out of contention did phone it in on the mound after trades, injuries or innings limits thinned their rotations. The Reds, for one, set a record for consecutive starts by rookie pitchers, with uneven results. We tried to account for fluctuating talent in two ways. First, we built a model to estimate the exit velocity of each batted ball based on the batter, the pitcher, the temperature, the count, the pitch velocity and the pitch’s called-strike probability. The model assigns a coefficient to each player, derived from actual results; for instance, Zack Greinke reduces estimated exit velocity by 1.5 mph, on average, while Kris Bryant increases it by 3 mph. Although the model does predict higher exit velocities late in the season, the predicted differences are small, on the order of 0.2 to 0.3 mph. 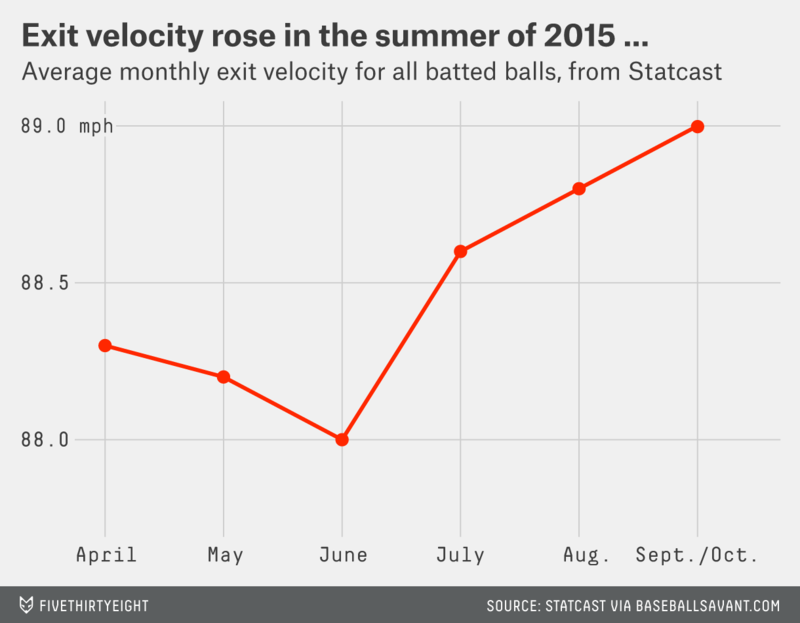 The actual exit velocities exceeded the model’s predictions by 0.13 mph in August, 0.46 mph in September and 0.86 mph in October. And those differences persist even if we limit our sample to full-season hitters and pitchers, which excludes prospects promoted late in the year and replacement-level pitchers who got garbage-time innings for eliminated teams. As a second check, we compared actual strikeout, walk and home-run rates (per plate appearance) in the second half to the strikeout, walk and home-run rates we would have expected at the All-Star break had we known exactly which batter-pitcher matchups we would see over the rest of the season. To do that, we obtained rest-of-season Steamer projections for every player, generated at the All-Star break, and applied them to the second-half matchups that actually took place (using the odds ratio method). The table below displays the differences between the predicted and actual results. In the second-half matchups, we saw roughly 8 percent more walks and 7 percent fewer strikeouts than Steamer would have expected — modest deviations, perhaps attributable to a league-wide increase in aggressiveness early in the count. Here too, though, the home-run rate stands out: There were 31 percent more home runs hit after the All-Star break than Steamer would have projected, even if it had predicted playing time perfectly. That’s an enormous number, with an astronomically small probability of occurring at random. Even if Steamer had been systematically underrating rookie hitters, it wouldn’t explain these results: In “Return of the Run,” an essay in the latest “Hardball Times Baseball Annual,” Jeff Sullivan calculated that rookies produced only a third of 2015’s increase in home runs, with the rest coming from carryover players. So: What about the ball? Some teams order enough balls at the beginning of the year to get them through the first half and then replenish their supplies at the break. If the ball had changed between opening day and midseason, we would expect to see results resembling the line in the chart. The history of clandestine big league baseball-adjusting goes back more than a century, and there is recent precedent for an unannounced ball change in a high-profile league: Japan’s baseball commissioner resigned in 2013 after news broke that NPB had secretly started using a livelier ball. Of course, there could be an innocent explanation for a change in the ball, since even a minor alteration in materials or manufacturing could produce a significant difference in the ball’s bounciness, or coefficient of restitution (COR). Major League Baseball’s vice president of communications, Michael Teevan, told us that MLB’s testing has uncovered no evidence of a meaningful change in the baseball. “As a quality control effort, we routinely do testing of baseballs in conjunction with our consultants at UMass-Lowell to ensure that they meet our specifications,” Teevan said. “To this point, we have not uncovered anything suggesting that the balls are related to the increased amount of home runs in the second half.” MLB’s analysis also failed to find a conclusive link between weather and last season’s increase in scoring. The takeaway: Balls were hit harder and cleared fences more often than expected in the second half of last season, even after our best attempts to account for talent and temperature. Because we can’t pinpoint a cause, we can’t say for certain whether 2015’s late-season offense was a misleading blip or a preview of 2016 scoring. This month’s spring-training scores3 suggest we should lean toward the latter: Both home-run rates and overall scoring have returned to their highest spring levels since 2013. Unfortunately, the only way to resolve the uncertainty is to study a larger sample, which means waiting for regular-season baseball to come back — as if we needed another reason to anticipate next week’s opening day. Thanks to David Appelman and Alan Nathan, who contributed research. Ben Lindbergh joins the Hot Takedown podcast to preview the 2016 MLB season. HITf/x, a camera-based system, reports lower exit velocities, on average, than Statcast, which tracks batted balls via Doppler radar. In addition, there is about a 1 in 10 chance that even if there had been a change in COR large enough to explain the increase in exit velocity, a particular batch of a dozen baseballs would show only a 0.003 increase. Which are strongly correlated with regular-season scores.